Port Douglas Bed and Breakfast overlooks the Great Barrier Reef, Australia, from Four Mile Beach. 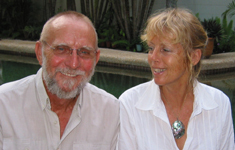 Proprietors of Port Douglas Bed and Breakfast, Frieda van Aller and Colin Horton, are a great team, whose serene outlook on life is spiced with a sense of fun and adventure, tempered with common-sense, practical overtones! I don’t know what Colin and Frieda will think of my description but there is no doubt that teamwork is one of their great strengths. Can you imagine the romance of their wedding on Thursday Island in the Torres Straits, a tropical island in the Coral Sea off the coast of Northern Australia? Balance that idyllic beginning with the harsh realities of life on their own prawn trawler working the unpredictable seas of the Great Barrier Reef. The teamwork, developed over twenty years of fishing, has carried over into their more relaxed life at Port Douglas Bed and Breakfast, which they opened four years ago. Frieda and Colin are very happy to welcome visitors to their home, a short stroll along a rainforest path to the famous Four Mile Beach, overlooking the Great Barrier Reef, Australia. What better way to start the day than to walk along the beach and watch the sun rise? Built around a quiet garden courtyard, this relaxed B&B offers guests two double bedrooms with ensuites, which overlook the central saltwater swimming pool. Rooms have queen sized beds, fans, refrigerator and air-conditioning, where smoking is not permitted. Rates are $140 per double or $100 single. A free tour booking service to fantastic Daintree Rainforest, Barrier Reef or Atherton Tableland destinations is available from Port Douglas B&B. Most tour operators will collect guests from their accommodation. A shuttle bus service runs regularly into Port Douglas and hire cars are readily available. Port Douglas Bed and Breakfast wins awards for great service. Trip Advisor regularly posts glowing comments about their standards of service. Valued members of the POrt Douglas community, Frieda and Colin generously gave substantial prizes for Carnivale art competitions held at our old gallery, Port Douglas Gallery of Fine Art. Their involvement in the art of the region developed into a new venture, Artquest Port Douglas, which featured demonstrations or workshops in artists' studios for small groups. As part of that experience, Frieda was happy to guide participants through the enjoyment of creating their own haiku poems. If this is something that you would enjoy or are just curious about, please check out some of her observations. 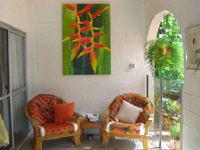 You will quickly feel “at home” in the peaceful atmosphere and comfortable tropical surrounds of Port Douglas Bed and Breakfast, where unobtrusive and friendly service help to make your holiday special. As for those tropical breakfasts…fruit tasting could become a whole new adventure! 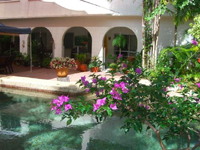 Contact Port Douglas B & B direct.